Mission: Make conference calls less painful. 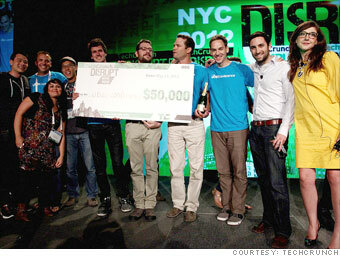 Conference calling service UberConference took home the $50,000 top prize at TechCrunch Disrupt. Created by Craig Walker, the entrepreneur behind Google Voice, the service allows users to skip the normal hassle of conference calls. "Audio conferencing is a $3 billion a year market, and there's been virtually zero innovation in the space in the last 30 years," Walker declared during his pitch. Using UberConference, callers don't need to enter PINs, and they're able to skip the painstaking process of introducing each person as they dial in. The free service lets users create a conference and email or text participants with the dial-in number. Once people call in, their profiles light up on the webpage, showing who's on the call and who hasn't joined yet. People on the conference call can view the names and profiles of other participants. Users can click on a participant and view his or her Twitter, Facebook, LinkedIn, and Google information to learn more. When a person is speaking, his or her picture is highlighted. One of the most popular features on UberConference is called "earmuffs." "Sometimes when you're on a call, you want to talk to some people on the call and not others," Walker said. To solve the problem, UberConference allows the administrator to put "earmuffs" on selected participants, muting them so they're unable to hear the conversation. Walker plans to make UberConference free, with the option for a paid premium version with extra features.